This book is for anyone who like animals and wants to expand knowledge with funny facts about them. Beautiful animals and insects, which are mentioned in this book, you can see in the village or city, and some of them only in the jungle or ocean. 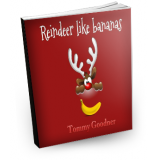 Inside this book you can find some funny facts for: monkey, dog, cat, squirrel, tiger,sheep, chicken, scorpion, dragonfly, cow, pig, shark, horse, mosquito, skunk, ant, flea,turtle, camel, whale,lion, housefly, panther, beaver, koala, bird, donkey, bat, gorilla, eel, bee, swan, falcon, iguana, reindeer. Every fact has comic illustration.